Hello ... Hello ... my old friends ... It's great to see you once again! It was duly confirmed earlier today (Friday 24th March) that Keane frontman Tom Chaplin and British country duo The Shires will "Follow Me Follow" in the footsteps of The Feeling and The Shoos in supporting Jeff Lynne's ELO during their four show arena and stadium dates in June and July later this year. 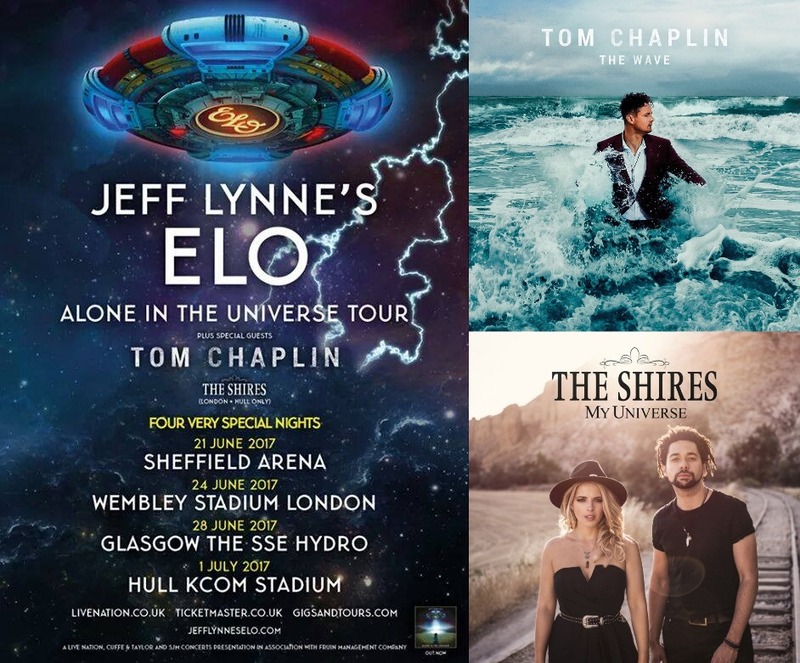 Tom will perform at all four Summer gigs whilst The Shires will bolster the support roster for the outdoor stadium shows at Wembley Stadium and Hull. Tom Chaplin is, of course, best known for his association with Brit pop/rock band Keane - who are currently on a break between albums. His debut solo album "The Wave" reached #3 in the UK Album Chart in October 2016. The Shires - who are Ben Earle and Crissie Rhodes - started out back in 2013 and have enjoyed considerable chart success with their two studio albums to date: "Brave" and "My Universe" peaking at #10 and #3 respectively here in the UK, both also certified Gold. Both artistes are sure to add some musical variety to the Jeff Lynne's ELO shows in Sheffield (Wednesday 21st June), London (Saturday 24th June), Glasgow (Wednesday 28th June) and Hull (Saturday 1st July). Yours Truly KJS and elobeatlesforever (elobf) will be seated in Block B4 for the Wembley Stadium gig and would love to meet any friends and/or followers of elobf on the day/night. See you there?